If you’re looking for a way to work with your dog’s prey drive to develop rock-solid obedience and strengthen the emotional bond between you and your dog, you’ve come to the right place. Chase squirrels/cats/other dogs/children on bikes/etc. ? Stop responding to you as the intensity of a situation increases? Constantly pull at the end of the leash? Show signs of stress or anxiety? Act aggressive towards other dogs or people? 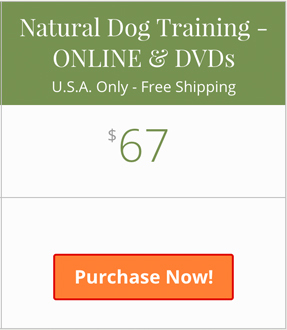 If you answered yes to any of these questions, then prepare to literally transform your relationship with your dog using the proven prey-drive based dog training techniques that I teach in my 2-DVD set Natural Dog Training: The Fundamentals. You learn how to harness your dog’s prey drive to attract them no matter how energized the situation. You learn how to channel your dog’s desire for something else into even more attention to you. You learn how to take this newfound attraction and turn it into rock-solid obedience that eliminates leash-pulling and gives you control – even at a distance when your dog is off-leash. And best of all – you and your dog will have lots of fun getting there. All dogs have prey drive, to varying degrees. It’s at the core of how a dog interacts with the world. When you learn how to work with your dog’s prey drive, you will see a huge shift in your dog’s behavior and emotional state. Your dog will become more focused on you, and less distracted by things “out there”. Your dog will be more relaxed (and so will you). And best of all, you will have a way of satisfying your dog at the core of their emotional being, so that there will be no doubt about your having the happiest dog on the block. Your dog figures out something to DO with that energy. An energized dog looks for something “prey-like” to be the recipient of that energy. These are things like – chase the squirrels, eat the sandwich, bark at the neighbor, chew the couch. Your dog can’t figure out something to do with that energy – and stores it, as stress. And more stress. This stress comes out as anxiety, aggression, submissive urination, and other problem behaviors. We want to help our dogs solve this problem, since it’s when a dog figures out the solution “for themselves” that things start to go awry. And as I just mentioned the key question that we have to answer for our dogs is “What do I do with this energy?” But the problem is that our dogs naturally see us as predators – especially when they’re all juiced up. We tower over our dogs, we have big eyes, big teeth, big hands – and loud voices. And usually, when our dogs get excited about something, we get even MORE excited – trying to get our dogs to do what we want, instead of what our dogs want to do. You know how I just said that an energized dog is ATTRACTED to things that are preylike? Well, how do you think an energized dog feels about things that are predator-like? That’s right – they are literally REPELLED by things that they perceive to be like predators. Have you ever seen that your dog was about to chase something, and then called your dog, only to have your command seem to have the opposite effect? Your dog chases that thing with even MORE determination than before you tried to call them back? That’s an example of this phenomenon in action. If you try to be the “alpha dog” – then you just make the problem worse. And don’t even bother with the clicker – your dog can’t even hear the clicks when they’re all hyped up. You can try making your dog less energized, but that just shuts them down and makes them more stressed out. So what’s the answer then? How do I use my dog’s prey drive to get what I want – a happy, well-mannered dog? In my groundbreaking 2-DVD set, “Natural Dog Training: The Fundamentals”, I teach you how to “Be the Moose” in your dog’s life. Step-by-step instruction shows you not only how to harness and attract your dog’s prey drive, but also how to work with your dog’s energy to get the kind of obedience that you want. By “the moose” – what I mean is that you learn how to be the thing in your dog’s life that will command your dog’s attention NO MATTER WHAT. A moose has that kind of pull for your dog – a magnetic attraction more compelling than any little squirrel, cat, dog, child, ham sandwich that your dog might encounter. When you develop that kind of emotional relationship with your dog, your dog will literally look to you when energized for an answer to the question of what they should do with their energy. All that prey drive that used to be focused on things “out there” in the world will now be focused on you and the easy way that you have to satisfy this deep desire within your dog. How to safely give your dog an outlet for their prey drive – and have FUN doing it. How to help your dog relax, even when the environment around them is chaotic and stressful. How to turn your dog’s attraction for something else (squirrels, cars, dogs, cats, etc.) into an even STRONGER attraction to you. How to turn your dog’s aggression towards other dogs/people into PLAYTIME with you. The RIGHT way to play tug-of-war with your dog – and a way of combining fetch and tug-of-war to give your dog the MOST SATISFYING playtime that they’ve ever experienced. Best of all, you will become comfortable working and playing with your dog no matter HOW energized your dog is. Your actions become natural and effortless, and consistently attract and satisfy your dog’s deepest nature. Heel – where your dog walks at your side looking up at you, magnetized by your presence, both on and off leash, when you WANT your dog to do so. Otherwise, your dog will walk on leash without pulling like crazy, just meandering within the limits of the leash that they’re on. Come – the kind of “Come” where your dog will come back to you, excited and energized, no matter what is distracting them – even if they’re in mid-chase of something enticing. All of the work is done on an extra-long leash – so you can focus on working with your dog, and your dog learns “obedience” without having to rely on feedback from a leash. It’s like training your dog to be off-leash and on-leash at the same time! All you have to do to transition from “off-leash” to “on-leash” is…pick up the leash. Trust me, it’s MUCH EASIER than trying to do it the other way around (transitioning from on-leash to off-leash). All lessons are presented in an easy-to-follow, step-by-step process that takes you from one thing to the next. There’s no guesswork – you just follow the steps that I show you on the DVDs and you WILL get from where you are now to where you want to be. My dog, Nola, used to be extremely aggressive towards other dogs. And even if I wanted to let her off leash I couldn’t, because she would chase any little critter in sight (in fact, she successfully caught squirrels). If I tried to call her, she would run off in the other direction looking for something to chase. And NOTHING in the “mainstream” dog training world of clicking or dominating helped her. 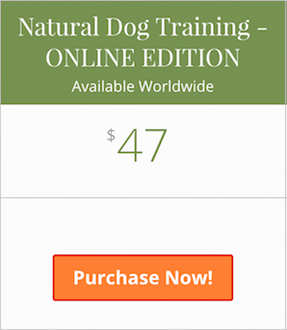 I heard about “Natural Dog Training” – and how it had been successful with dog’s just like mine, and I traveled to Vermont to learn exactly HOW to do it from the guy who invented it. And I watched my dog, Nola, literally transform before my eyes. After watching her change into a dog who stuck by my side, listened to my call, and stopped trying to eat other dogs, I decided to start teaching other people in person how to use Natural Dog Training with their dogs. Eventually I started NaturalDogBlog.com to teach these same methods over the internet. It became clear, though, that the written word only can convey so much – as they say, “a picture’s worth a thousand words”. And I think that video is pretty much worth a million words. So all of my experience with teaching other people how to use Natural Dog Training went into the production of my DVD set. 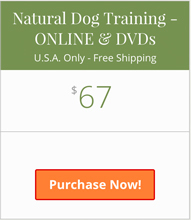 I want you to have a practical, simple way to get the same kinds of results with your dog that I got with my dog. 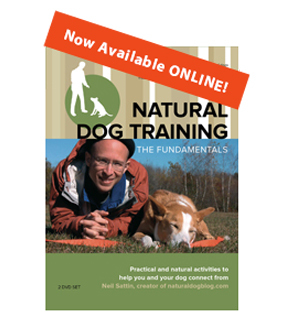 If you have a hyper dog, with lots of energy – or a problem dog who chases squirrels or gets into fights with other dogs – or simply want to develop a stronger emotional bond with your dog, then Natural Dog Training: The Fundamentals is perfect for you. But don’t take my word for it – try it for yourself, and see how much of a difference it can make in your dog’s life (and your life) when you know how to USE your dog’s prey drive. I guarantee that you’ll transform your relationship with your dog, and that you’ll both be happier for it.